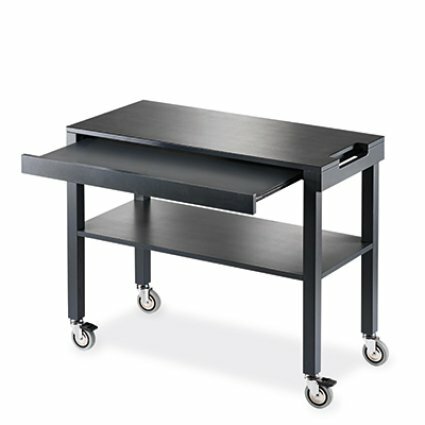 Service trolley with structure in solid wood and 2 shelves in MDF. 6842 is a service trolley with structure in solid wood with squared section and with 2 shelves in MDF, available in anthracite, cream and turtledove. Matt lacquering. The push handle is integrated in the upper shelve and the dishes-rack support is extractable. The swiveling wheels have a diameter of 9,5 cm; two of them are with bridle.